Jury Awards Sen. Rand Paul More Than $580,000 In Damages After Attack By Neighbor The neighbor had previously pleaded guilty to assaulting a member of Congress. The attack was prompted by a pile of brush Paul left near the line dividing their Kentucky properties. 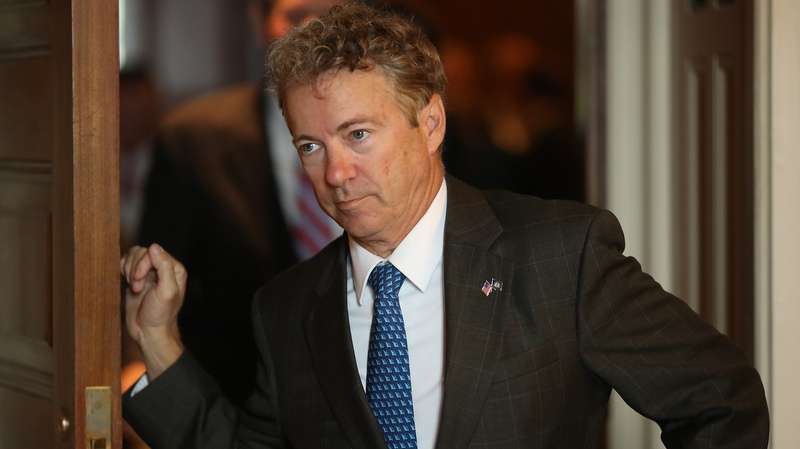 Sen. Rand Paul, R-Ky., has been awarded more than a half-million dollars in damages after being injured in an assault by a neighbor. A Kentucky jury has awarded U.S. Sen. Rand Paul more than $580,000 in damages stemming from a November 2017 dispute in which a neighbor tackled the Republican lawmaker, who was doing yardwork at his home in Bowling Green. Paul suffered six broken ribs. The neighbor, then-59-year-old Rene Boucher, was charged with assaulting a member of Congress, a felony under federal law. He pleaded guilty in March 2018. Boucher received a 30-day prison sentence in June and paid a $10,000 fine. The attack was not politically motivated, according to Boucher, but was prompted by Paul's leaving brush and leaves between their two properties. The jury awarded Paul $375,000 in punitive damages and $200,000 for pain and suffering, plus $7,834 for medical expenses. Boucher's attorney, Matt Baker, said his client will appeal the damage award.